Cuyahoga was born in 2004. At that time, it was really 'different' from to other .NET applications with its use of NHibernate and the early adoption of the Castle Windsor IoC container. But after 10 years, no new development is done anymore and the 2.0 version never really took off. However, there are still quite a few Cuyahoga sites steadily running in production. Most of these are version 1.6. This version was released in 2009 and doesn't run too smooth on current .NET platforms anymore. 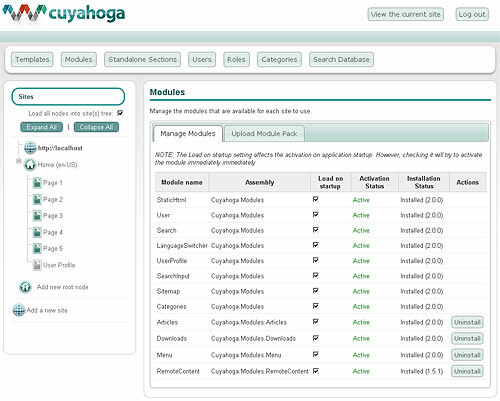 To enable Cuyahoga on modern .NET platforms and to celebrate the 10th anniversary of Cuyahoga, a new version is released. After some testing this is first version of what is the Cuyahoga 2.0 release. This is the Alpha therefore not officially recommended for production use (although I am ;)). SQL Server, PostgreSQL and MySQL databases are supported. The more people that post issues they find during use the faster development will progress. The sources will move to be along side the other Cuyahoga versions at beta time. For the time being I will develop here. In the coming weeks, there will be more updates to the source and posts describing some of the new features and what we have planned for the final 2.0 release. That's a different Cuyahoga 2.0! Perhaps you have seen it on the forums lately: there have been some serious changes in Cuyahoga development. Originally, we planned to build a complete new admin interface for Cuyahoga 2.0 with ASP.NET MVC and an Alpha version was even released. Unfortunately, I did not have enough time to proceed full speed and the new interface caused some mixed reactions. Luckily John Lynch (Constructor) stood up and has 'cooked' his own 2.0 version that was a mixture of the old Cuyahoga 2.0 core, but with a very much improved admin interface. It soon became clear to me that his version was the way to go especially because it caused so many positive reactions. So now we have it. A new Cuyahoga 2.0 Alpha version! Get it here and read the official announcement here. At the same time I'd like to officially announce that John is now the Lead Developer of Cuyahoga and my role will be more in the background where I'm going support the project with QA and release management. This glut of modules where contributed by John Lynch and Glow Labs. We are hoping to release a module directory to list all contributed modules in one place. During the latest release cycle, the slow SourceForge SVN service was a major source of irritation.